As Windows 7 handles the registry in a different way than Windows XP and the earlier operating systems, a registry defragmenter would not be a must for your system, but from time to time a registry clean would be recommended if you are like me and like to install and uninstall all kind of tools and programs just to test them out. There are many registry cleaners for Windows 7 out there that you can choose from and today we are going to test one of the freeware versions available for download. The product we are going to test today it is called AML Registry Cleaner. You can download the software from the AML Software website by clicking here. First thing you would notice is that AML Software does not write anywhere on their website if the AML Registry Cleaner it is made for Windows 7, it will just say that the supported operating systems are Windows XP/2003/Vista/Windows7 (32 and 64 bit). AML Software web page looks simple and there is a bit of work to be done in order to make it more user friendly and a bit more trustworthy. The installation is pretty standard, simple and straight forward. There are no sponsored browser add-ons or sponsored applications to be installed with the software, which is a good thing. No system restart it is necessary after the installation. 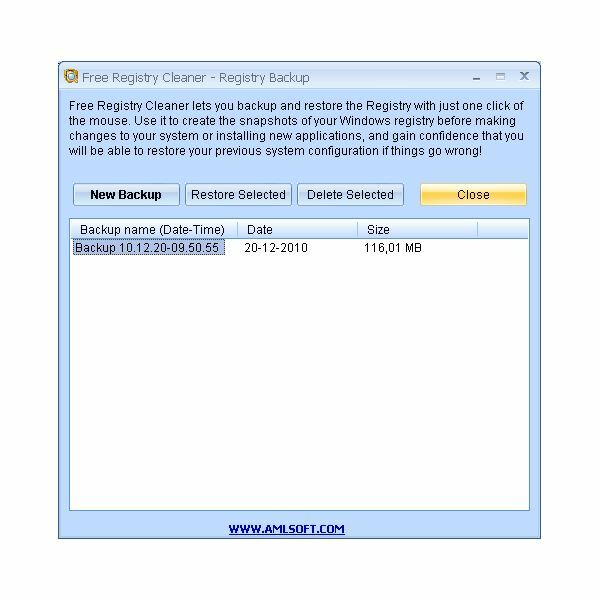 When you first start the registry cleaner, it will ask you to perform a backup of the registry which I highly recommend to anyone that uses registry cleaners. This allows you to undo any changes that may be made. The main interface is simple and user friendly, presenting a few main functions like: "Scan Now", "Wizard", "Show Options", "Backup Restore". Beside this, the software also has some extra utilities like a Registry Search, Disk Cleaner, Startup Manager, Uninstall Manager and a Process Manager which are all quite handy. When the program is performing the first scan you will be presented with some options on which sections to be scanned which I have left all marked as by default. The scan process will show you the issues found as they appear after a full scan. When the scan is complete, you have the option to choose all the issues to be fixed or just the selected one. You can choose only the issues you want to be fixed by selecting each individual issue using the CTRL + Left Click. By default the scanner will also scan for missing links or shortcuts for files on your network drives and or CD-rom drives. This feature can be turned on or off by pressing "Show Options" on the left menu. Under the advanced features we can select which registry keys to be scanned by default, what registry keys should be excluded by default and any other parts of registry keys that should not be scanned, plus the option mentioned earlier to exclude any references to network drives and CD/DVD drives. As an extra option, you can also "Edit the registry key" which its an option not present on other better known registry cleaners. If you are pretty familiar with the windows Registry and you know that a specific registry key should be excluded from the scanning process, you can also "Add to exclude list" and that specific registry key will not be scanned the next time the registry cleaner will run. After you selected the issued to be fixed, you can "Fix All" or only "Fix Selected". When all the selected issues have been fixed, the scanner will return to the main screen waiting for the user to perform further operations. The AML Registry Cleaner presents a simple and friendly user interface, intuitive menus and features while the scan and clean process is plain and simple. As all the other Registry Cleaners out there, AML Registry Cleaner has also the "Disk Cleaner" option to scan and clean the hard drive for any temporary and any unused files on your hard disk. The "Disk Cleaner" will open a new window and will let you select individual disk drives to be scanned. Disk Cleaner can individually scan your Temporary Files, Recent Files, Temporary Internet Files and Cookies. Startup Manager is also included as an extra tool of the AML Registry Cleaner. Startup Manager is actually a more simplified version of the MSConfig utility and can help you remove any unnecessary programs from the startup sequence. This can be done for the "Current User" or for "All Users" using your computer. You will have the option to "Create Key", "Delete Key" or "Modify Key". This is actually a good feature to have as with MsConfig you can only enable or disable a startup item, but don't have the option to Modify an entry option. That feature is not even available in many other registry cleaners on the market. Beside this two extra utilities, we have an "Uninstall Manager" that is also available in almost all the other registry cleaners and a "Process Manager" which it is not so often presented within other application from competitors. On the left main menu we also have a "Check for Update" button that will actually take you to the AML Software website in order to check for any available updated. After pressing the button you will be taken to the website to check for updates instead of a more subtle update downloader that we can see built in into other applications of this kind. 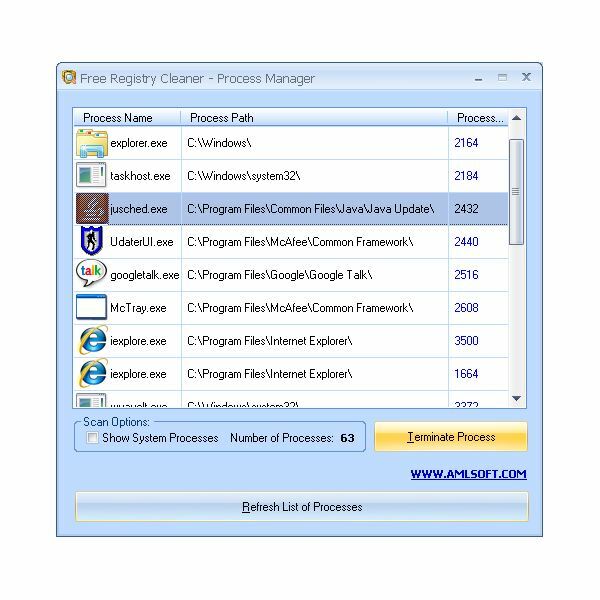 AML's Registry Cleaner is simple to install and easy to use with some features that are not present on competing products. The user interface is intuitive and user friendly. Utilities are also composed from tools that any intermediate user can use and benefit from. 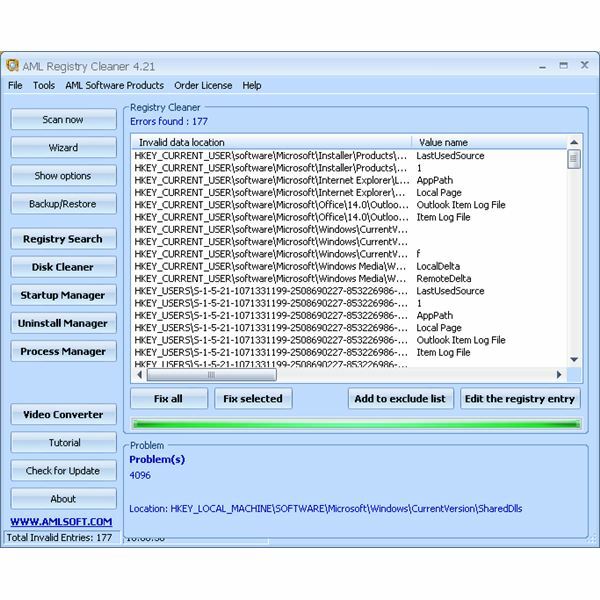 AML Registry Cleaner is a strong competitor for all the other freeware products on the market like CCleaner, Comodo or any other freeware registry cleaning product. The only weak spot that I noticed on this product it's the update process that will actually take you to the AML Software website in order to download any updates that might be available, instead of a built in auto update process. AML Registry Cleaner is a young product on the market, compared to the others, and the support might not yet be as good as for other products of its kind but this its something that will be better in the future. Looks like the software developers behind this product have really made their homework and studied the actual user needs before they have launched the product and they have came up with a product that fits the user needs. This product can be easy used by any beginner and also by the more experienced users making it a useful utility package. If I would have to give an overall score to this product, based on it's actual functionality and usability I would have to give it 4.8 out of 5 stars.